Thank you for joining us this month for our Incentive Trip/Grand Vacation Blog hop. 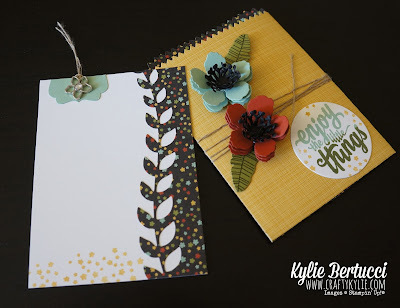 These are the top Stampin' Up! Demonstrators from around the world that have achieved the Mediterranean Cruise next year. This month our theme is "Seeing 3D" This means a 3D project! I am not usually one who does 3D projects and I need to do them more often with all our wonderful dies and thinlits. Currently you are visiting my blog Kylie Bertucci. There is a list of who is participating below and you can continue hopping around the other blogs by clicking on the person below me in the list. Here are the projects that I made using the brand new Botanical Gardens Designer Series Paper, Botanical Builder Framelits Dies and the Botanical Blooms Stamp set. 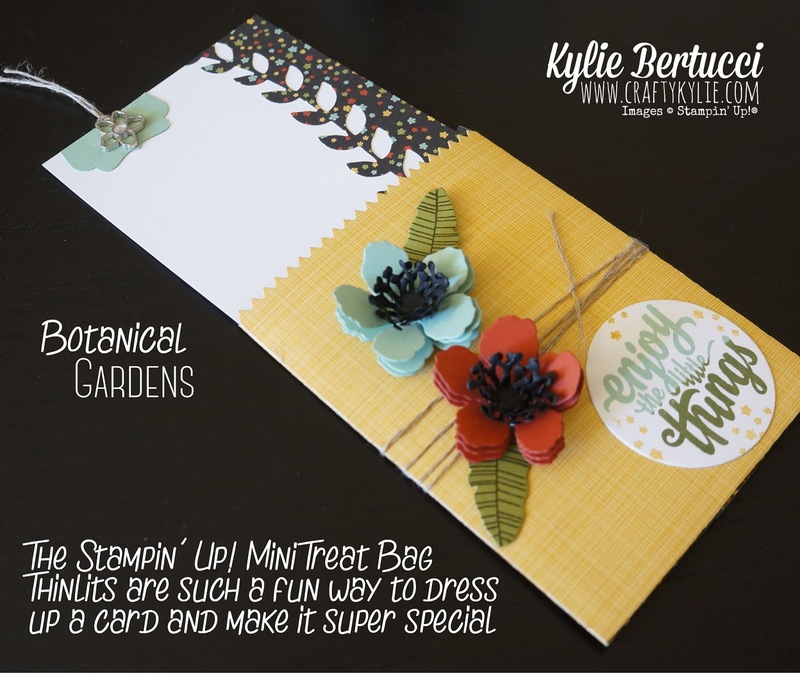 I adore the Mini Treat bag - and dressed up using the Botanical Builder Framelits Dies are such a winner. Anyone would be so thrilled to receive this as a gift. I also adore the Berry Basket with the Botanical Gardens Suite. It says garden to me and what a great way to dress up a small gift or some chocolates in this handmade basket with added embellishments. So remember that currently you are visiting my blog Kylie Bertucci. Here is a list of who is participating below and you can continue hopping around the other blogs by clicking on the person below me in the list. For those that live in Australia - would you like a FREE Occasions and SAB catalogue? Click here to request one. Thanks Angela! It is worth all the work - how much fun is this hop! Thanks Lisa - its so exciting using new goodies! Love that your project is a sneak peek! Beautiful! Thanks Georgia, yes enjoying seeing new product. Oh I would hate to make you envious Cynthia!! But at least now I know it won't be long till you get your hands on them. LOVE the little treat bag, Kylie; you've inspired me to get out those delightful thinlits that I haven't used in forever! Yes the treat bag is totally adorable Christine - it was great to pull that out and the basket as I haven't used them both in a while, but mix it up with something new. Thanks for your comment. 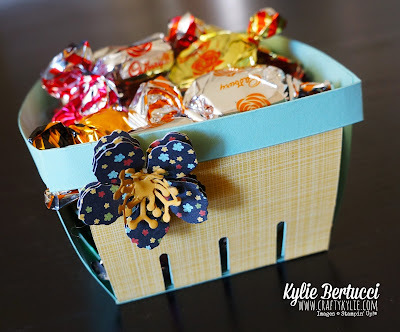 Lovely bright and colourful projects that are so "you" Kylie. After seeing your projects those Botanical Builder thinlits dies are calling my name. Thanks Ann! Yes those thinlits are stunning - you totally need them. Ow I love this .. great colors and the set is great! These are fabulous!! I love how you did the edge of the card with the die. That's awesome. 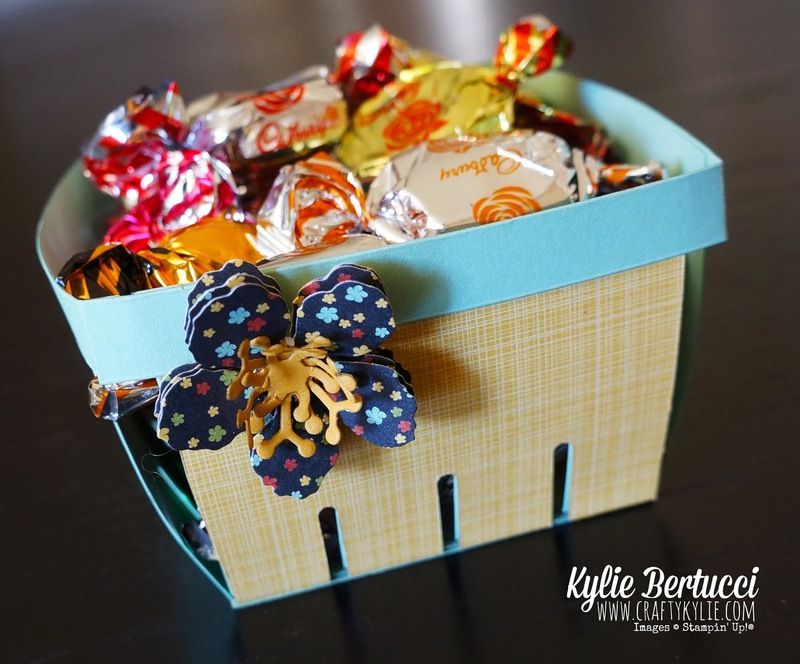 Such a great candy basket! Love that notebook too! How exciting to see these new products in use! 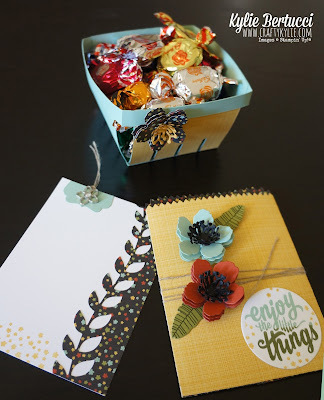 Your projects are gorgeous! Your basket looks lovely made in these colours. Adorable Kylie. You made me want to get that die back out and use it :) Thanks for all you do. You are fantastic. Your projects are very pretty!! those flowers are so pretty! Can't wait to order!